Operation Starfire is still a vivid memory for Woodbury's Art Petty. Editor's Note: This article about Art Petty is taken from a series produced by the Marine Corps about Operation Starfire during the Vietnam War. WOODBURY - Arthur "Art" Orville Petty Jr. served on active duty in the Marine Corps during World War II and the Vietnam War. 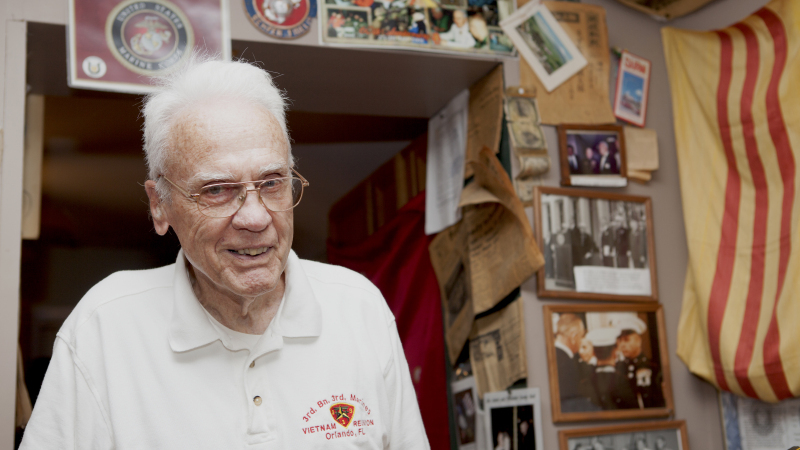 Enlisting March 13, 1941, Petty would have never guessed the struggles and challenges he and his Marines would have to endure during his time in the Corps. "I was 18 when I joined. I went to boot camp in San Diego, California. We slept in tents on cots. When I came out of boot camp, I was supposed to go to China, but I missed the boat because I caught the measles or the chicken pox from someone in my tent." Petty was transferred to San Clemente Island in California, and quickly made his mark as a Marine there. "I could fight with my fists, so I entered the interservice boxing tournament. I won two fights in one night, and my commanding officer thought I could do no wrong. I think I made sergeant real fast. I taught reserve officers how to drill at San Clemente as a private first class, corporal and sergeant. It was an amazing place. I had an amazing time out there." Next, Petty was transferred to Hawaii and joined the fight during World War II, participating in the campaigns at Saipan, Tinian and Okinawa with K Company, 3rd Battalion, 2nd Marine Regiment. "I've found the first couple of battles you are in you learn a lot. I feel I'm a survivor of WWII. Everyone who was with me in WWII was either wounded or has died since. I had some real hard battles in WWII." Petty was discharged from the Corps in 1946 and was called back to active duty during 1950. He worked various duties until becoming the company first sergeant of Company I, 3rd Battalion, 3rd Marine Regiment, 3rd Marine Division. Petty and his Marines deployed to Vietnam in May 1965 and set up camp near Chu Lai. "I had asked my commanding officer why we never patrol down on the coast from where we were. We did night excursions, but we never went down to the coast line. We made the landing into enemy territory to begin Operation Starlite the next morning. The Viet Cong were really good at camouflage." At one point during Operation Starlite, Petty helped carry wounded Marines on stretchers to helicopters for evacuation. The landing zone was only large enough for one helicopter. "One of my Marines named Reed and I had talked the night before Starlite. He had a dream or premonition that he was going to be killed. He was wounded during the operation and I carried him on the stretcher. I tried to put him on the helicopter and the pilot stuck his head out the window and said, 'Don't put him on. I won't be able to get off the ground.' I said, 'I've got to get him on.' I knew Reed so well that I wanted to help him. The helicopter took off without him, so we got him on the next one." Thankfully, Reed survived his injuries. Another time during the operation, Petty and his Marines picked up some enemy prisoners along with weapons the prisoners had taken from Marines earlier during the operation. "I had one VC, so determined when we captured him, he actually bit his tongue so that blood ran out of his mouth. He was big for a VC. I had one of the Marines pick him up and take him away, so he could be interrogated. We had picked up rifles from dead VC they got from wounding or killing Marines from the 4th Marine Regiment." Petty shares that he wished somethings regarding leadership were different during the operation. "Starlite was a demanding operation. We put officers through all kinds of school in order to learn how to fight on the battlefield. Then young men are elected to government positions and they are dictating to officers what to do. This causes some problems like in Starlite. We were not supposed to load our weapons until we were shot at. We had to ask permission to shoot back. Any good infantryman knows that this does not work well. If officers could just run everything, I think things would go a lot smoother." Petty also participated in several other battles before leaving Vietnam in September 1965. As he departed, he mourned the Marines in his company who had died. "I'm considered a tough old guy, but I cried in Starlite because I knew those guys and their families. They weren't just people. The Marines were people I knew pretty well. I lost a lot of good guys. I lost some really good people." Petty faced mental and emotional struggles after the war in Vietnam, and reintegrating into civilian life proved to be a challenge as well. "When I came back, I didn't care much about anything. Things were just bad. Once I had gone to apply for a job. The lady interviewing me said I had a good resumé. She asked if I had been in Vietnam. I answered her 'yes' and she tore up my resumé right there. That is what many people thought of Vietnam veterans." The hardest challenge of Operation Starlite for Petty was after combat. After arriving back in the United States, it fell on his shoulders to visit many of the families of his Marines who did not return alive. "The toughest job is notifying families [that their loved one had died]. This is especially hard when the Marines are in your unit and you know the families. I was sent to tell the wife of one of my friends, who was a sergeant major, that he had been killed. I took my wife with me. I had to tell her that her husband was dead. That is tough when you are friends." Petty shared that his family helped him overcome struggles and challenges after returning from Vietnam. Petty tried to improve himself over the years to be a better husband and father. "I got better because I have a wife and two daughters. They are good people. I've done the best I can do." This story is part of an ongoing series of Marines who participated in Operation Starlite in Vietnam, 1965.